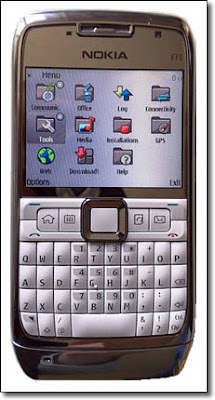 The new Nokia e71 looks great, and has all the features that make the phone so appealing. It has a very slim profile, 3.2 mp camera, and the ability to pick your phone service! It features QuickOffice which lets you create, edit and send Word/PowerPoint/Excel files. The cool factor is the E71 two home screens: one for word apps and one for fun, like audio, video and games. One button toggles between the screens. Get a glimpse of the e71 below.